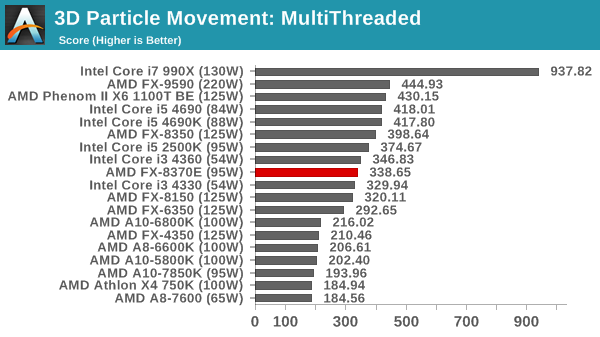 The dynamics of CPU Turbo modes, with both Intel and AMD, can cause concern during environments with a variable threaded workload. 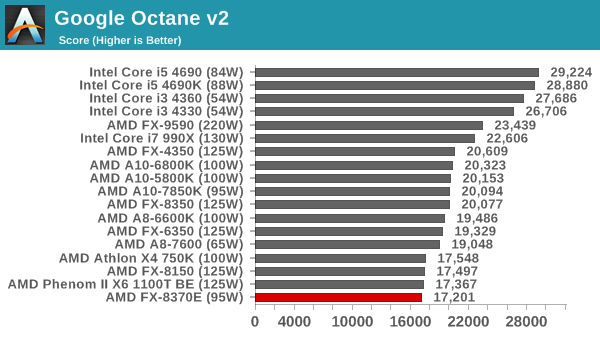 There is also an added issue of the motherboard remaining consistent, depending on how the motherboard manufacturer wants to add in their own boosting technologies over the ones that Intel would prefer they used. 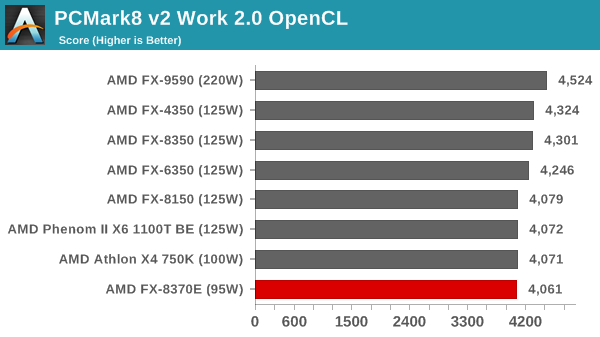 In order to remain consistent, we implement an OS-level unique high performance mode on all the CPUs we test which should override any motherboard manufacturer performance mode. 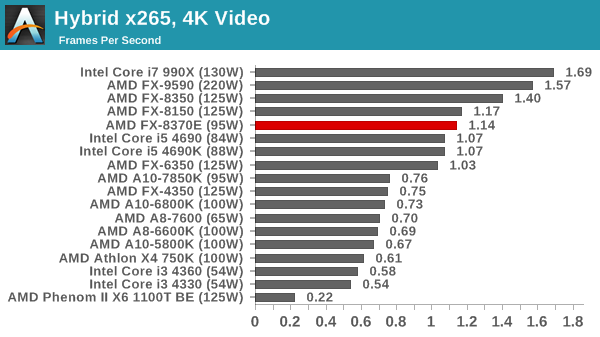 Handbrake balances cores and frequency, with the LQ film test often condensing CPUs based on frequency and the double UHD test expanding by cores. The double UHD test puts the 8370E at the bottom of the AMD 8-thread CPUs as expected. 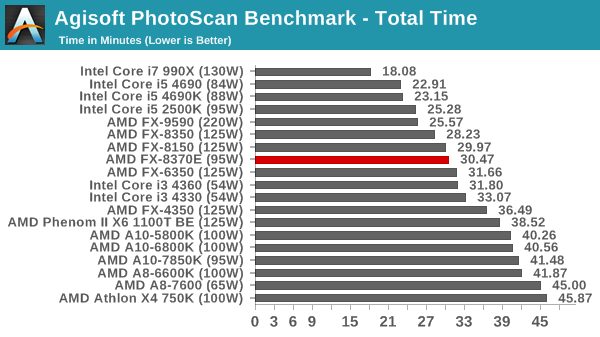 Photoscan results seem to take the following order: i7, i5, FX (8), FX (6), i3, FX (4), A10, A8. 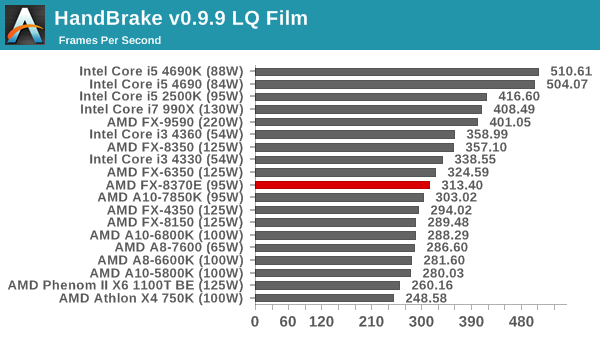 The 8370E sits at the bottom of the FX 8-thread section as before. 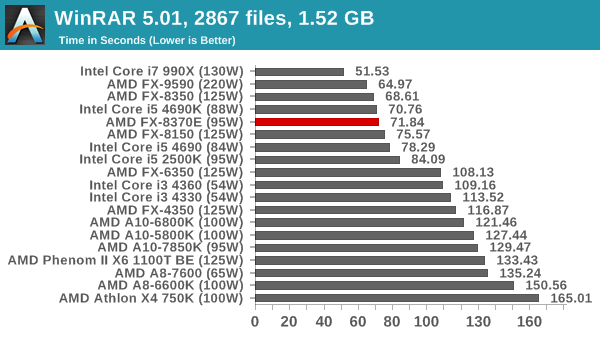 WinRAR takes advantage of all the AMD threads due to its integer workloads. 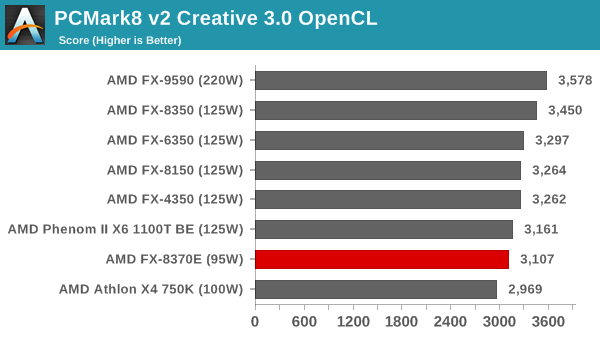 A new addition to our CPU testing suite is PCMark8 v2, where we test the Work 2.0 and Creative 3.0 suites in OpenCL mode. 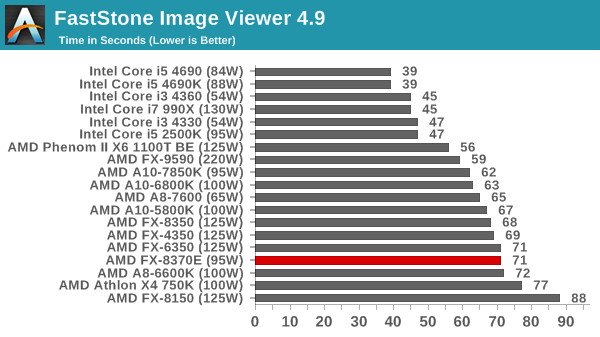 As this test is new, we have not run it on many AMD systems yet and will do so as soon as we can. 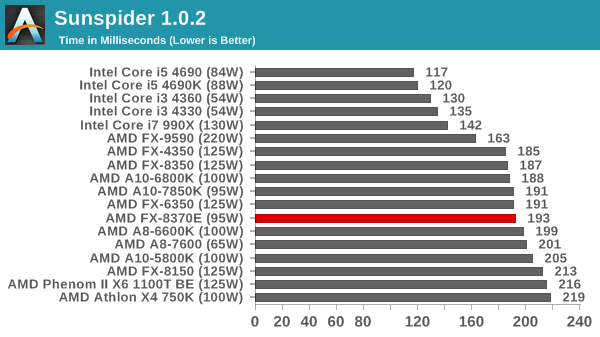 The PCMark8 tests both seem to favor frequency at this point, with the FX-9590 taking the lead. 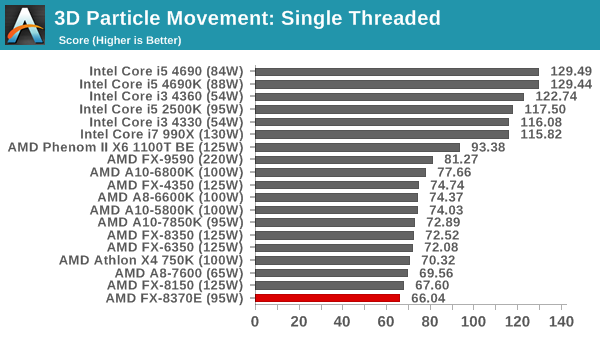 Again, more threads gives an intesting workload. 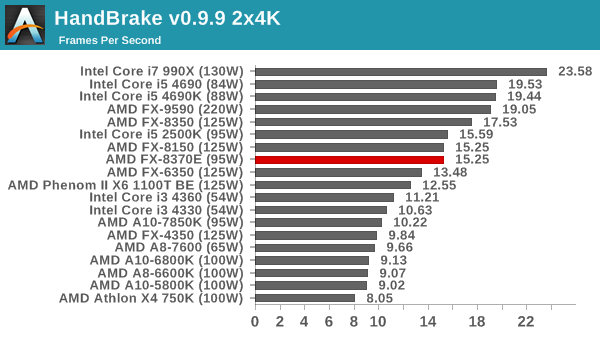 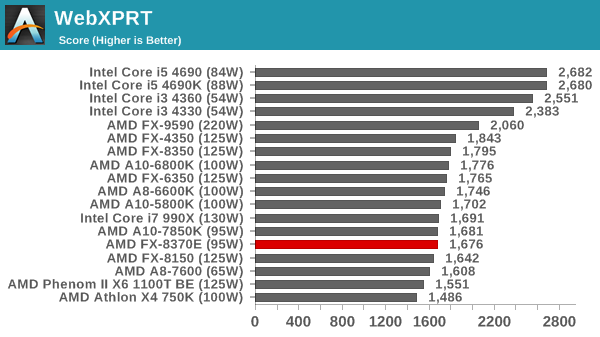 The FX-8370E beats out the i5-4690K as well. 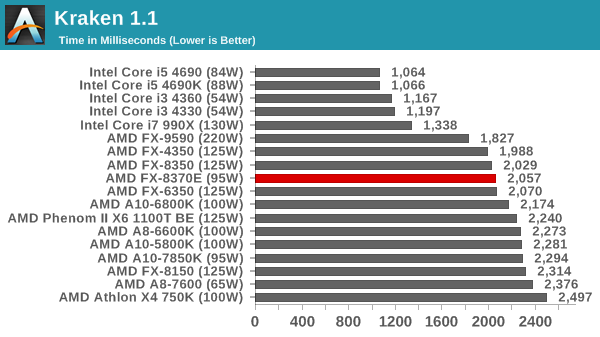 Unfortunately the Achilles heel strikes again in single threaded performance. 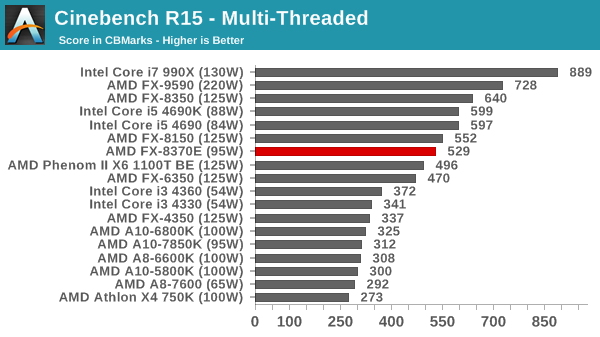 Multithreaded puts it just behind the FX-8150.